SludgSickle never got to be a sticker, but if it had, maybe it would have looked like this. Was SludgSickle slated for Series 2? Twenty five of the 1973 2nd Series stickers were based on the 1969 Wacky Ads. If you look at the order of the 2nd Series Checklist and Sheet, the first 26 wackys are all taken from the 1969 Wacky Ads. The only title out of place is Sugarmess. Of the missing Wacky Ads, Garbage Baby Food was changed to Gurgle, and Good and Empty, Metrekill, and Melty Way were all dropped before the 2nd Series began. But Guerilla Milk and SludgSickle were still viable candidates. 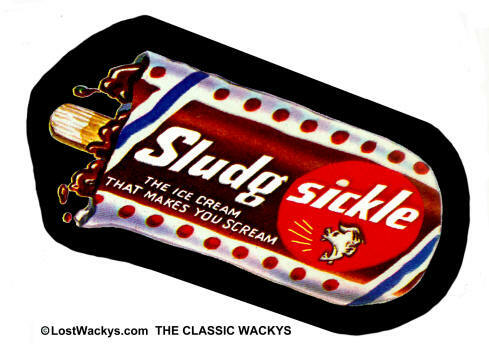 Guerilla Milk was probably left out due to its Vietnam War theme, but what of SludgSickle? Was it booted out to make room for a Topps product? Read more about Sugarmess.